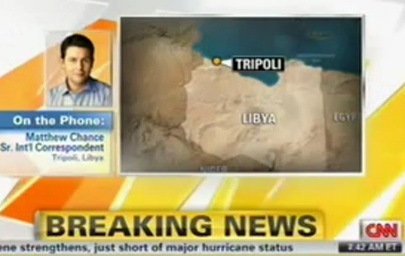 CNN’s Matthew Chance, who has been tweeting from inside the Rixos Hotel in Tripoli, delivered a live report on developments at the hotel where journalists are reportedly being held against their will. Chance told American Morning‘s hosts of some alarming developments, describing how five more journalists had sought refuge from gun battles in the hotel, and are now unable to leave. According to Chance, that brings the total of journalists at the Rixos to about forty. Update – they have been freed from captivity. Chance described, first, an incident in which an outside journalist successfully negotiated his way into the Rixos to bring another journalist out, but once outside, a gun battle caused their driver to flee, and both journalists to return to captivity in the hotel. Another four journalists, Chance said, entered the hotel as a result of gunfights, and are now unable to leave. Internet jokesters have already begun referencing the tunnels in satirical “reviews” on the Rixos Google Maps page, which could become far less amusing as the situation at the hotel develops.